I have been super excited for this week though because I get to share another video blog with you, as part of The Girl Behind the Blog series! I look forward to this event every month! It gives me a chance to share more of who I am "behind the blog", and I love getting to know other bloggers better too. This month's video prompt is about how blogging has changed me as a person. I thought this was a very appropriate topic to discuss, as my 6-month "blog-aversary" just passed, and I feel like my life has really changed since I began blogging. There are probably a few more things I could share about how I've changed and how the blogging world has blessed me, but I think this video sums it up pretty well. Thanks to Ashley and Sarah for hosting this month's series! Click the adorable picture below if you'd like to see all of the videos, or enter your own! Also - coming up I'm going to be sharing more about my 4'8" height, and how that has affected my life. If you have any questions about my (lack of) height :), please email me, leave a comment, or find me on Twitter! yes, checking our attitude when we are going through different things! I didnt think about that before, but yes, we have to be much more contemplative and choose our words carfully. As always, love your face (and blinking) and glad you linked up! This is like the perfect little evaluation for your six month anniversary of blogging! 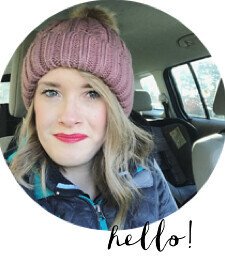 I just passed three years of blogging at What She Saw and am coming up on five years of blogging altogether and it was so good to use this to see where I've been and where I'm going, and see how well I've kept on track, and what's come out of it. I loved hearing your answers! Your blog is very definitely a blessing to me. I'm so excited to read your post about being 4'8"! I'm 5'1", so I'm sure some things will be similar but I'm sure others will be a lot different. PS. I don't suppose jumping like a mad fool and/or climbing on store shelves to get things off the top shelves at grocery stores is going to make an appearance? Not that I would know anything about that. haha. Blogging does make me very contemplative and has empowered me to check my attitude. I am so glad that I found your blog because it has encouraged me in sooo many ways! The Lord is using you Mackenzie! girl, i think you are so beautiful and have such a sweet, gentle spirit. i love the background music of the video also :) can i ask, what is the song called? i agree, blogging has helped me to be more contemplative as well. just love you sister! I love your blog. I love how you are showing your struggle with embracing the role of mom and what that means. I went through the same struggle 5 years ago and I hear myself in your story.